We, at EcoArrivals, obsessively keep you well-informed on unusually green furniture items, such as the DIY Guitar Case Table, Stark Naked Tree Trunk and Classified Moto’s recycled bike table or the more awesome pieces like the Dodai Bench, Top Gear engine coffee table and BRC Designs’ Wingin’ It Low Table. Now, making its foray into our anthology of eco-friendly furniture items, the Waste Less Chair designed by Hungary based Architecture Uncomfortable Workshop puts reclaimed oak timber logs to better use. 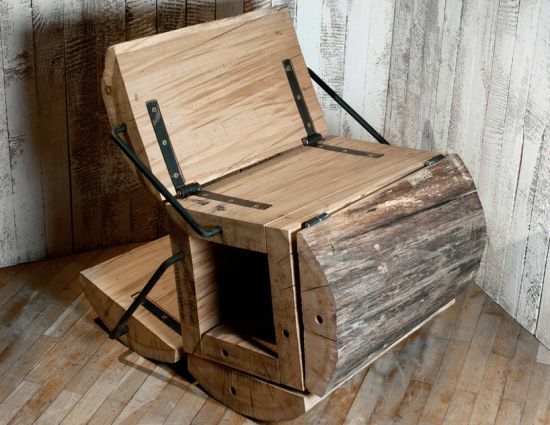 For creating this one-of-its-kind chair, the furniture designer processed oak timber logs into wood beams and then, assembled them together to produce a weirdly usable furniture piece. The Waste Less Chair serves a dual function as it can be used as a rocking chair or one with a leg rest. DesignBoom notes that the piece collapses into its natural form when you don’t feel like using it.